Asian fusion dishes are wildly popular these days. 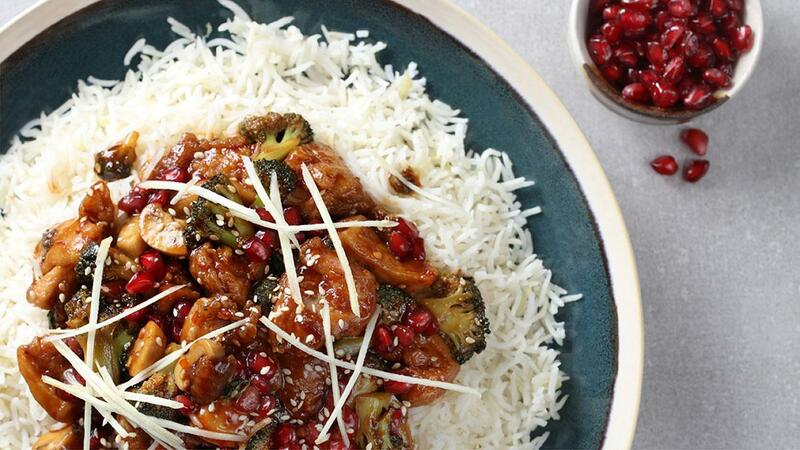 Sesame Chicken with Ginger Rice Pilaf is a Chinese inspired stir-fry dish which consists of broccoli, chicken and mushrooms along with a few twists like pomegranate seeds and juice. The sauce is potent and spicy with a tinge of sweet making sure this dish excites all the senses. View the full recipe below. Slice the chicken into bite size cubes and marinate with a little sesame oil, Rafhan Corn Oil and Knorr chicken Stock Powder for up to 12 hours. After marinating dust with Knorr Batter Mix. In a wok sear off the chicken pieces in a little oil mix, keep aside for later. In a large pot add a little oil, onions and washed rice to the pot, toast the rice along with the onions for 2 minutes. Add the ginger and garlic, sauté for a few minutes longer. Whisk all the ingredients together and keep until finishing off the dish. In a wok stir-fry the broccoli and mushrooms in a little oil mix. Add the chicken and cooked rice. Before serving mix in sesame seeds and pomegranate seeds.